Known variously as "'the Windy City,"' "'the City of Big Shoulders,"' or "'Chi-Raq,"' Chicago is one of the most widely celebrated, routinely demonized, and thoroughly contested cities in the world. Chicago is the city of Gwendolyn Brooks and Chief Keef, Al Capone and Richard Wright, Lucy Parsons and Nelson Algren, Harold Washington and Studs Terkel. It is the city of Fred Hampton, House Music, and the Haymarket Martyrs. 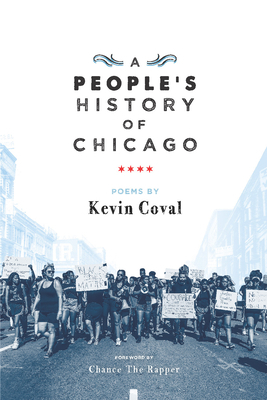 Writing in the tradition of Howard Zinn, Kevin Coval's A People's History of Chicago celebrates the history of this great American city from the perspective of those on the margins, whose stories often go untold. These seventy-seven poems (for the city's seventy-seven neighborhoods) honor the everyday lives and enduring resistance of the city's workers, poor people, and people of color, whose cultural and political revolutions continue to shape the social landscape. Kevin Coval is the poet/author/editor of seven books including The BreakBeat Poets: New American Poetry in the Age of Hip-Hop and the play, This Iis Modern Art, co-written with Idris Goodwin. Founder of Louder Than A Bomb: The Chicago Youth Poetry Festival and the Artistic Director of Young Chicago Authors, Coval teaches hip-hop aesthetics at the University of Illinois--Chicago. The Chicago Tribune has named him "the voice of the new Chicago" and the Boston Globe calls him "the city's unofficial poet laureate." Kevin Coval is a poet and community builder. As the artistic director of Young Chicago Authors, founder of Louder Than A Bomb: The Chicago Youth Poetry Festival, and professor at the University of Illinois-Chicago--where he teaches hip-hop aesthetics--he's mentored thousands of young writers, artists and musicians. He is the author and editor of ten books, including The BreakBeat Poets: New American Poetry in the Age of Hip-Hop and Schtick, and co-author of the play, This is Modern Art. His work has appeared in Poetry Magazine, The Drunken Boat, Chicago Tribune, CNN, Fake Shore Drive, Huffington Post, and four seasons of HBO's Def Poetry Jam.